Completely renovated in Nov/Dec 2017. New flooring, bathroom, kitchenette, windows, paint, and furniture. Light, bright, and modern! 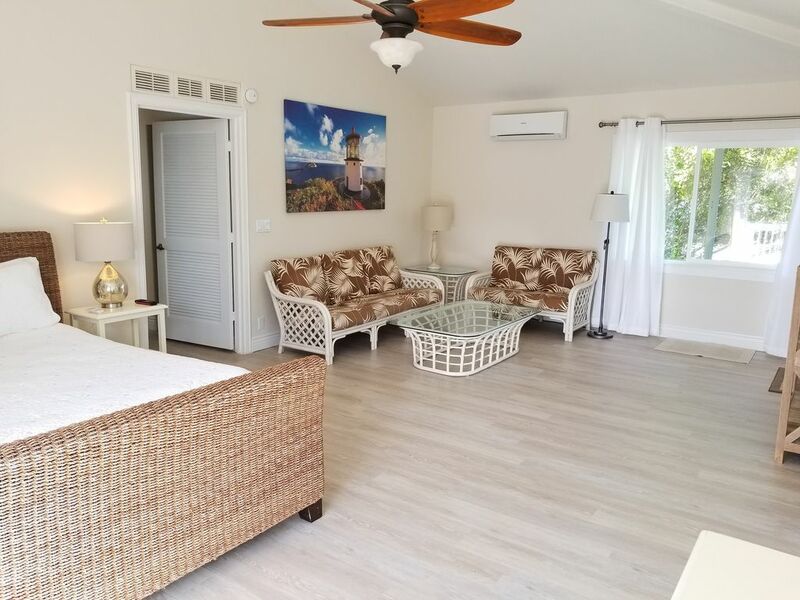 Cool and breezy, this is a second-story suite in a quiet area with private entrance and off-street parking on the beautiful Windward side of Oahu. Only a two-minute walk (300 yards) to the white sand of world famous Kailua Beach. Gated and secure, with parking provided on property. Over 1000 square feet of living space includes a large master bedroom/sitting room, huge walk-in closet, full bathroom, 2nd sleeping/living room with well equipped kitchenette with dining area. Free wi-fi connection. Quiet split AC keeps the suite cool, or if you prefer fresh air, , large ceiling fans, plenty of windows and sliding doors circulate the ocean breezes. Sleeps 5 comfortably, with 2 Queen beds and a twin bed. If you are traveling as a family, the adults can have the bedroom/sitting room, while the children sleep/play/relax in the other room. With high cathedral ceilings and very spacious, airy rooms, our guests often comment that the suite is much larger than the pictures can portray, and has a very comfortable, homey feel. You can easily cook light meals in the kitchenette, as there is a glass top hot plate, a toaster oven, electric skillet, microwave, coffee maker and kettle. There is also a gas BBQ grill outside with a table and chairs for 4 for an outside eating option. We provide beach chairs, boogie boards, a beach umbrella, cooler, and beach towels. The beach is a short 2-4 minute walk from the suite, being only 300 yards away, so it's easy to walk back and forth several times a day if you want..There's an outside shower for rinsing sand off before you come inside. If you like to rise early, it's really special to catch the sunrise and take an early walk along the beach, which is 2.5 miles of white sand with no rocks. Many of our guests have commented that even after checking out many of the beaches on the island, they prefer Kailua Beach best out of them all. Kailua Beach was actually voted the #1 beach in the US in 2014. It's also a family-friendly beach, as the waves don't ever get very big (unless there's a storm or front coming through). Lanikai Beach, another popular family friendly beach, is only 5 minutes or less by car. Kailua town is only a couple of minutes from the suite by car, and it has grocery stores, restaurants, cafes, and some good shops and boutiques, as well as Target and Whole Foods. It's a nice town to stroll around and there's good shopping there. Kailua is actually a central location, as Honolulu and the city attractions are about 30 minutes to the South of the suite, and the North shore and Windward coast attractions are about 40-50 minutes to the North. Waimanalo Beach, Hanauma Bay, Sea Life Park, and Mokapu Beach and Lighthouse hike are between 20-35 minutes along the coast to the South also, so Kailua is a very central place to stay as a base. I am sorry, this suite is not suitable for infants and children under 5, so I am unable to accept reservations with children 5 and under. This little place is fantastic, our family of five fit just fine and the site is a few blocks to the best beach in Kailua. Our family of four, 2 adults and 2 teenagers have really enjoyed our stay in Mandy's apartment. It is spacious and very clean and had everything we needed, Loved the birds chirping in the morning. It is an easy walk to the beach from the apartment. The beach is absolutely stunning, one of the best in the country, if not in the world. We kayaked to one of the Twin Islands, saw turtles, did stand up paddle, even kiteboarded one day. Great beach to walk or run on, see sunrises and swim as well. Our stay at Kalama tract was fantastic. We had been to Oahu previously and stayed on the North Shore, but fell in love with Kailua beach when we visited on our last trip and were determined to stay as close to Kailua beach as our budget would allow. This property fit the needs of our family of 3 and then some! The suite itself was very clean and well kept! The bathroom and kitchen appear to have been recently updated. Light, bright, and breezy are the words that come to mind! The location is great. A short walk to beach access on to Kailua bay near Kalama Beach park. This part of the beach is not as busy as Kailua beach park proper and was perfect for boogie boarding. Note that boards, beach chairs, umbrellas, towels, beach cooler, and snorkels were all provided at the rental. If you want to spend time at Kailua Beach park, it is only a 5 min drive. The suite is part of a larger building that is behind a locked gate and set back from a small side street, so while the building is shared, it was very quiet. One thing to keep in mind with this rental is that the kitchen facilities are adequate for a single family or group of up to 4-5 people to cook small meals. Overall, an awesome experience, I wouldn't hesitate to recommend this property to anyone looking to stay in Kailua! We had a wonderful time at this location. The rooms were spacious; check-in was easy; everything was as described. I would absolutely stay here again. We really enjoyed our stay here and would definitely recommend it.. The owners, Mandy and Richard, were both very nice as was their son who carried our luggage to the door. It's a short walk to the beach and a short drive into the main part of town so the location is great. It's a gated property which was a nice bonus. We didn't see a single bug or gecko the entire time which was great. I lived on Oahu 20 years ago and I know there can be a lot of bugs so kudos to them for keeping this place so clean and bug-free. Both rooms are really large and bright / airy feeling as they have vaulted ceilings. The entire place is clean and light and relatively modern. The beds were comfortable. There's a huge walk in closet that's great for storing suitcases. I really can't think of anything negative with this place or our experience staying here. Thanks Richard and Mandy! This suite is very centrally located--it is 20-25 minutes from Honolulu and 45 minutes from the North Shore. It is just a few minutes drive from Kailua town, and Kailua Beach is only 300 yards away. You can drive along the coast to the South and within 25 minutes get to Seal Life Park, Mokapu Beach, Hanauma Bay for snorkelling. Many of my guests have commented that they found the location perfect as it is so central to everything. Taxes for a stay of 30+ nights is 4.71% Minimum 5 night stay unless there's a window between bookings There is a $45 administrative fee if a person makes a reservation and then cancels it. A 4-4.5% booking fee is added for every credit card transaction.